I know this is a strange thing for me to talk about; a compact makeup bag. Even though I cleared out a big chunk of my make up last year, I still have a lot of the stuff. And even though I’m currently on maternity leave I still make the time to put on my face because I love wearing the stuff. But having kids definitely impacts on my makeup adventures. Firstly, they always need something. Whether it’s literally, like a nappy change a refill of the water bottle. Or just generally keeping an eye on them so they do something potentially harmful (and let’s face it, that’s pretty much everything). This greatly limits the amount of time I can divide my attention, so my makeup application needs to be quick. So no messing around with cut creases and layering cream and powder contours. And when you have a toddler who wants to touch everything you’re touching and makes off with your brushes when you aren’t looking, keeping the number of products in use to a minimum also becomes a factor. So I decided to pick my makeup in advance. I originally kept it in a basket, but Luna would either empty it and play with everything or make off with the whole thing, so I opted for something small, more compact. I have several makeup bags from gift-with-purchases I’ve received over the years, but this one seems to be the best. 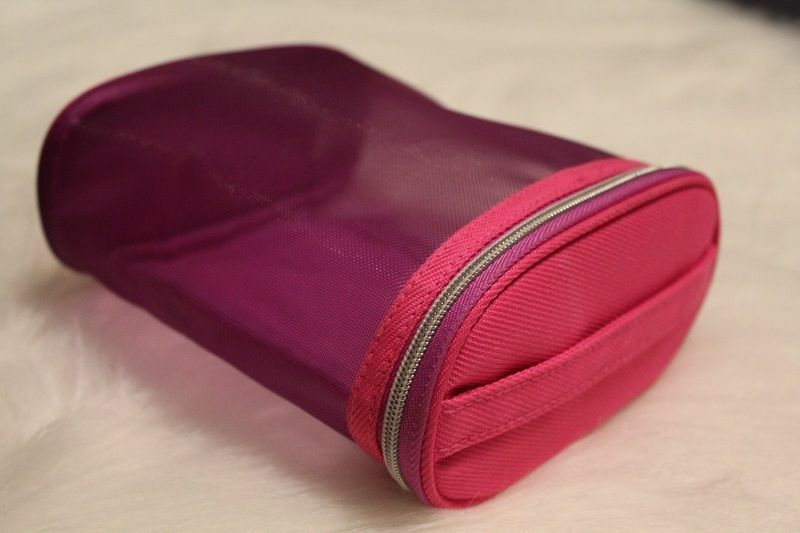 Instead of being a wide pouch like traditional makeup bags, this is tall and structured. It’s tall enough to fit my brushes without bending the bristles. I can stack all my products inside and not have worry about anything rattling around, it makes everything so organised and because everything is upright I don’t have to worry about my brushes getting mucked up by the bits of makeup powder the collects at the bottom of makeup bags. The best part is the handle on top, the grab and go feature. I’ve been doing this for a couple of months now. It coincides with my Project Pan Challenges. I pick enough items for a full face that I want to focus on for that month. They stay in the makeup bag until they’re finished or until the end of the month when I change them out. And if there’s anything else I want, like a different shade of lipstick or shadow base, I can just pluck it from my stash. This is a great way to utilise a larger than average makeup collection. By changing up your makeup regularly you give all your products equal use and increases your chances of actually finishing things. And there is the added bonus of being able to get rid of things you don’t like as much as you thought. So many times in the past I had items I thought I loved but only used every so often, it was only when I used them consistently that I realised they didn’t work for me. I have really been enjoying this little trick, it saves me so much time in the morning. I just grab the bag and 10 minutes later I’m ready for whatever the day throws at me.